He's like a big puppy from another world, which spits corrosive acid. Some monsters are simply animals. They might be unusually smart or have extra limbs or even heads, they might be bigger than their real-world counterparts, but in the end they're clearly the domain of zoologists and concerned mainly with food, territory and mating. Some monsters go out of the way to make life difficult for the hero or humans in general, they are Always Chaotic Evil. Some monsters are so powerful and dangerous they are beyond the very comprehension of mortal men; the wisest course of action on encountering one of those is to run, and even then the odds are against you. And then there is another kind of monster. Maybe they're just a baby, and someday they'll grow up into one of the first types of monsters, but until then they're not so bad. Maybe they've discovered The Power of Friendship. Maybe they try to be evil, but they're not very good at it. Maybe in-universe they're horrifying, but the audience gets to see the softer side of them. But whatever the reason, these monsters aren't very monstrous. Simply put, they're adorable. Related to Cute Monster Girl, but where those are generally cute in a sexualized way, these are generally cute in the sense of kittens, puppies and babies. Fanfic focused on cute monsters is generally less focused on relationships between them and humans than fanfic focused on Cute Monster Girls; sure, it happens sometimes, but not as often and when it does it's less supported by the Canon. If owned by one of the main characters may count as a Cool Pet. As mentioned above, some of these also count as Ridiculously Cute Critters, but these are all still monsters, and they just happen to not be dangerous, or not dangerous to the right people, or only in an endearing way. In some cases, the Cute Monster might be an Eldritch Abomination themselves, see also Adorable Abomination. Slime Life:Slime as low-level starter monster? Meh. Slime as low-level starter employee, looking to impress his boss? Adorable! X-Men: Lockheed the dragon. Most of the time. He's a purple dragon, but the size of a dog or even just a housecat. He's treated as a pet by Kitty Pryde, and he's fine with that. Spot, a.k.a. The Beast With No Name in Stanley and His Monster is a big, bashful, loveable furry Demon who got kicked out of Hell for being too nice. In Neither a Bird nor a Plane, it's Deku!, Izuku meets the tentacled and shark-headed spawn of a Kaiju while looking for a place to train his powers in secret. He's terrified of them at first and runs away screaming, but later discovers that the creatures (which he names Mi-Gos) are actually quite docile unless threatened. Over the course of his Training Montage, he brings them toys, food, and memorabilia for them to play with and enjoy. They're also adorably excited at the sight of ice. Izuku is sad to leave them behind when he's ready to take the U.A. Entrance Exam. In Men in Black the newborn alien that Jay helps deliver. Presumably mom's tentacles beat the everloving crap out of Jay during labor, but the resultant infant is downright adorable. And a squid. The Wizard of Oz has the Cowardly Lion. He's a monster, attacking Dorothy and friends in the woods, but as soon as he's startled by a dog barking he needs cheering up and help with his own problem as much as Dorothy's party needs help with theirs. Godzilla vs. SpaceGodzilla has Godzilla's pre-adolescent son, Little Godzilla. Subverted in Dragonslayer. The adult dragon, and the baby dragons, are anything but cute ( especially when gulping down big hunks of bloody raw princess meat). But when the adult finds the babies killed, it nuzzles them and whimpers in a way that might just garner a little sympathy and sorrow from the audience. This echoes comments of the Squishy Wizard at the beginning of the movie—he seemed to find dragons at least likeable, if not actually cute, and set out to destroy this one only because it was old and suffering. Toothless of How to Train Your Dragon somehow manages to be one of the cutest dragons, and also one of the fiercest dragons, depending on his mood. It helps that his pupils are dilated when in a friendly mood. Experiment 626, a.k.a. Stitch from Lilo & Stitch, who was originally designed by Jumba as bullet-proof, fire-proof, with superhuman strength, a computer-like mind, and a primary instinct of destroying everything it touches. As soon as 626 disguises himself as a dog and allows Lilo to adopt him and call him Stitch, he eventually learns the meaning of family and goes on a rescue mission, finding his place with his newfound family and purpose of existence, with his instincts becoming more occasionally mischievous and less destructive in future franchise chapters. The dragons of the Temeraire series. They're roughly as intelligent as humans and most of them grow to be massive, but they're generally flighty and very compassionate to their human companions. And while they're intelligent, they only have the wisdom and common sense appropriate for their life experience, and most dragons we see are just a few months or years old. Thus there are many scenes where Temeraire has to be told politely but firmly that he can't just eat any cow he sees, they should be bought and paid for, even if it seems unfair to him that he can freely eat any fish he catches; and despite his size he makes slower progress than a human while walking because he's curious about every unfamiliar rock, tree and house he sees; and they think of human babies as eggs, and it's painfully awkward to explain to them that humans give birth differently; and feral dragons jockey for status among themselves on the most puffed-up pretenses. The Boojumverse has Cheshires, little eldritch beasties which are treated a lot like cats. They're useful for hunting extradimensional Cthuloid vermin like Toves, and are intelligent and loyal towards their owners. They are actually young Hounds of Tindalos; and if their growth wasn't stunted to prevent them from maturing, they would become members of the race of unstoppable monsters called Bandersnatches. In The Iron Teeth web serial, Blacknail the goblin is small little fellow with big cute eyes. He's also totally devoid of anything resembling morals and thinks nothing of killing people or other living things. His small size and tiny reach makes violence somewhat difficult for him though. The hair monsters (something like an Urban Fantasy version of a tribble or long-haired guinea pig) in Dreadful Company. The frog-meets-raccoon well monsters as well, in a more Ugly Cute way. The Zarbi from the serial "The Web Planet". Giant, chirping ants that, due to being possessed by an Eldritch Abomination, have become violent and driven the entire sapient population of a planet off to their moon... that communicate by dancing, wander over curiously to see what the Doctor is up to (like cows in a field) and make friendly pets for the resident Fluffy Tamer. The triceratops in "Dinosaurs on a Spaceship" is fun and plays fetch. "The Tsuranga Conundrum": The Pting is a dangerous creature that eats any inorganic material, has poisonous skin and moves incredibly fast... that's only attacking the ship because it's hungry and sees it as food, and is surprisingly cute-looking. Tuatha from The Fallen Gods has a three-headed Cerberus-Yorkie whose three names (Susiyenka, Bingan, Kekesi) all mean "biscuit" in various languages and is referred to as "Triscuit" as a whole. Pseudodragons are miniature dragons the size of housecats and with similar personalities, although they have human-level intelligence and the draconic love of shiny things. The Gray Render is a two-ton monstrosity of fangs and claws... that is driven to bond with random creatures, whom it guards with its life and brings gifts of fresh meat. Beasts of Nurgle in Warhammer and Warhammer 40,000 are basically Gigantic Friendly Slugs that just want to play and hug people... shame about the corrosive slime, noxious gasses and other pestilential bodily fluids they constantly emit. The raison d'etre of the system-neutral Baby Bestiary supplements. Complete with rearing tips so your characters can raise their very own adorable (or at least Ugly Cute) pet baby monster or adopted monster child. 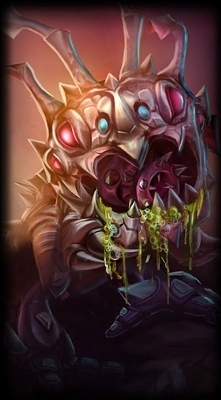 League of Legends Kog'Maw provides the page image. He's an alien omnivore from the same dimension that spawned Cho'Gath and Kha'Zix, drove Malzahar to insanity and nearly got to Kassadin as well. Despite this Kog'Maw isn't as much evil as he is hungry, and the combination of his innocent mannerism and endearing behaviour (which includes chasing his own tail) has won the hearts of many players. It helps that he's been given a number of cute skins, including a pug costume. Spike from Space Quest V: The Next Mutation is treated as one, despite whiddling acid and being a facehugger in all but name. The Pokémon-Amie feature introduced in Pokémon X and Y allows the player to pet and play with any of their Pokémon. While some do try and play it cool, others prove to be adorably affectionate, often in spite of an intimidating appearance. Standout examples include Hydreigon, the "Brutal Pokémon" that is said to spend its life in a constant state of vicious rage and devour anything and everything in its path, and Yveltal, the legendary embodiment of destruction. The gorlocs in World of Warcraft. They're amphibious critters with gigantic mouths full of sharp teeth and not very pleasant to look at overall, but the poor grammar and childish, innocent manner possessed by the friendly ones makes them adorable regardless. Cerberus in Zeus And Sons. The stray daemonkin in the first act of Marla. The Inexplicable Adventures of Bob! has Snookums the Tentacle Bunny, Oogrook the Unicorn (aka "Rainbow Sunshine"), and Nessie the Loch Ness Monster. Tower of God: The Mandong Whales. At least the males. Harpy Gee has Pumpkin the young Goblin Cat. He generally just functions as Harpy's Bag of Holding though he did eat her magic when she was a child. His mother is almost an Eldritch Abomination by comparison, destroying an entire kingdom in the past and is currently sealed in the moon. A number of characters in Shrek, but especially Dragon and the dragon-donkey hybrids even more so. At the end of the second movie and through the third they are small, round fuzzballs, barely flying on tiny wings, randomly breathing tiny, almost-harmless jets of flame. The vegetarian sharks in Finding Nemo. They have self-control problems when they smell blood, but the rest of the time they are all too eager to help the protagonists with their problems. Nibbler. An alien about as big as a dog, with three eyes and a distending jaw and massive appetite who poops starship fuel, kept as a pet by Leela. Later in the series revealed to be a member of a highly intelligent alien race, but still a big eater and happy to be kept as a pet as long as his litter box is cleaned regularly. The Buggalos are also this. The titular monster, Francoeur, in A Monster in Paris is absolutely adorable. He is a seven-foot, blue, anthropomorphized flea who has four arms and big, red eyes. He also doesn't talk outside of the music segments and communicates with chirps, making him a Cute Mute for double the adorable. Insectosaurus from Monsters vs. Aliens. A fuzzy baby caterpillar the size of a city block. The show's being what they were, many of the monsters in He-Man and the Masters of the Universe and She-Ra: Princess of Power fell into this if they weren't meant to look majestic somehow. Most memorable was Orko's pet from Trolla, a seven foot tall three eyed T-Rex like creature that felt the need to glop him when it wasn't being mind controlled. On the other side of the spectrum was Hordak's little buddy Imp, who tended to have all the mannerisms of a spoiled child.